Discussion in 'Android Devices' started by Maddog241, Sep 21, 2011. Android Police have linked up a new RUU for version 2.11.605.2. Could this be the official? I'm going to flash and will report back. Originally got MD5 mismatch, but there was a typo in the original leak post. All good now. scotty85, Yeahha and Ibrick like this. Ooh, this could be it. September is getting close to it's end if HTC is going to live up to their date then I would think so. I am not all that excited but good find. Once you get it flashed can you check to see if the VM notification bug has been worked out? Sorry to report, but voicemail notifications still appear to be broken. Google Talk is working again and the camera is ok so far. I guess that's progress. If rooted with s-off I would assume this loses root, but would keep s-off correct? I plan to go back to stock soon to sell this phone anyways. Is it safe for me to flash? Depends on what version of hboot you have. I would suggest waiting until the stock rooted rom comes along. thanks, will do. Not sure what version, I rooted it and got s-off about 4 months ago. Will it still matter when the official ruu is released? I don't know. If you have the eng hboot and run the RUU you will lose root and have s-on I *think*. If you have the perm s-off hboot it would block it but you may get stuck in a boot loop until you can remove the PG05IMG.zip from the SD and flash a rom. If you have revolutionary then it would block it and you may or may not get the boot loop as I really don't know all that much about revolutionary. I used the Revolutionary tool to obtain permanent s-off. I stopped at that point as all I wanted at this time is the ability to flash back to a stock RUU after trying a leak. I flashed this leak through HBoot with no problems. All that happened was it bypassed updating the bootloader. if you have the 1.04.2000 eng hboot,then do not flash this. it will overwrite your hboot to be s-on. if you rooted with revolionary,then flash away. your revolutionary hboot will still be there after,and you can hboot flash a recovery,then flash superuser. trapperjohn, Thats and Yeahha like this. Scotty, a guy over at rootz flashed and it rewrote his bootloader to s-on. 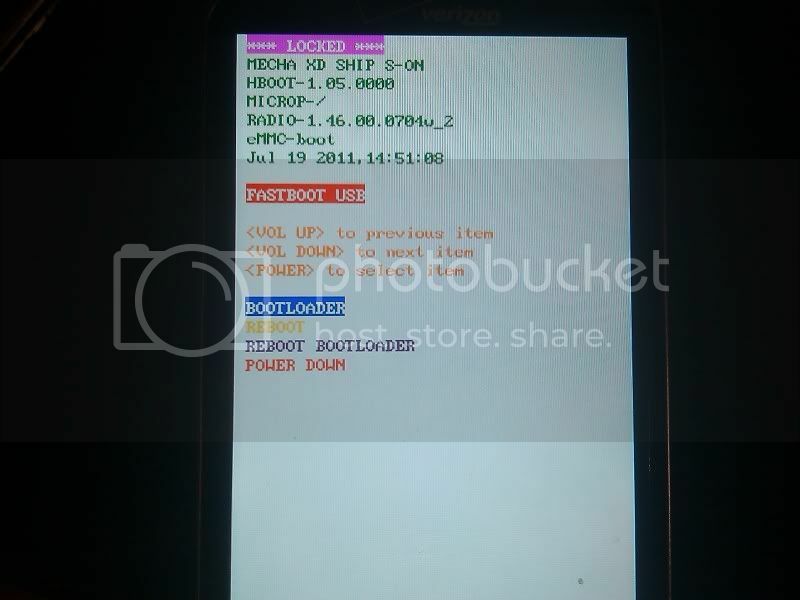 He said the bootloader now says "locked" at the top any idea if you can still root via revolutionary? Then it can't be the OTA. did it look like this?! yes,revolutionary will root it just fine. i flashed that hboot and rooted it with no issues. Yeah I would love to see what was changed between this and the prior leak. so... when are we going to get the OTA? Sorry the CM team is on leave currently, they seem to be the only people who work on the RIL (well that and the MIUI team). Perhaps HTC will just release all the source code and let the devs have a go at it then it would be fixed. The only real problems I had with the last leak, in addition to the VM lack of notification, were camera and Google Talk fc's. So far in this one, the only thing I have seen is the remaining problem with vm indicator. It does concern me that the vm indicator problem has persisted for this long. So if I'm not rooted, this is ok to flash? You could flash this if not rooted. However, there are concerns. 1) It will wipe all phone data. 2) You can not go back unless you root. 3) You will not get the official OTA if/when it ever comes out. You will have to flash the official release in the same manner as this, once again wiping all your phone data. This leak is pretty good with the exception of voicemail indicator still being broken. No, sorry but that is incorrect. If you are rooted and used revolutionary you can not flash this it will block it. If you are rooted via the manual method depending on your hboot it will either block it or you will lose root. I am also not sure about if you wouldn't get the OTA if you flash this. Given the official OTA is a higher version than this you should still get it but you may have to manually check for it, if it is a lower version (which is unlikely) then you won't be able to flash it even with the RUU without having to root. when youve rooted with revolutionary,youre fine to flash whatever RUUs you please,higher or lower. i went back to the first mr2 leak,and tried for an hour manually checking to see if it would OTA to official MR2, never happened. other than that,i did feel it was smoother and less laggy than 2.10.605.0. looks like a lil progress was made at least. I still not convinced that it won't update for you if you were to stay on it. I seem to recall people trying to get an OTA and have been unable to even manually checking. If flashing this prevents any OTA updates then why someone would flash the ruu leak without root is beyond me. as for the OTA,when i go back to mr1,or shipping firmware(1.12.605.6 or 1.12.605.9) it OTAs right away,ive done it several times. i went back to 1.66.605.2 wich was never a release firmware. i signed in to my google account,let it sync,then tried checking for updates for an hour. every time it said "your system is up to date"
Unless the rom reads as 1.70.605.blahblah, OTAs will not be received, and will not be installed. Every OTA contains mostly patch files. These patch files require certain file versions and the installer script alone looks for the above version. When it does not find it, it aborts. you are welcome to do your own testing,of course... i wasnt willing to stay on that firmware for hours,days or weeks,lol an hour was enuff to convince me that adeenalyn was prolly right. You are absolutely right about completing the root process would save setup time with each new install. It is kinda time consuming to set everything up. Old habits die hard. I always took the time to reinstall everything when I updated the BB's over the years and I didn't have a lot of the problems that others did. Maybe that doesn't matter as much on Android, but it seemed to make a huge difference back then. I'm not an easily discouraged leak tester and I haven't gone back to stock yet since I used the Revolutionary tool.